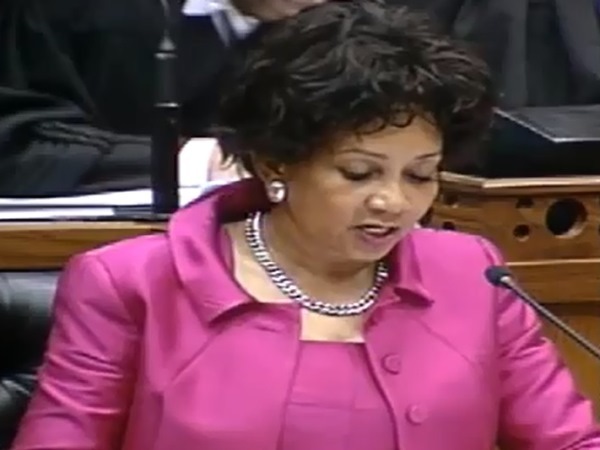 The 10 most memorable moments from Minister Lindiwe Sisulu’s speech at the SONA debate 2014. Minister of Public Service and Administration Lindiwe Sisulu took no prisoners during part 2 of the State Of The Nation Address (SONA) debate that took place yesterday in Parliament. Political parties were given the opportunity to share their views on President Jacob Zuma’s State of the Nation Address. When it was Lindiwe’s turn, she gave everyone a piece of her mind. It was definitely a speech worthy of a couch and a bowl of popcorn. Here are the 10 most memorable moments from Minister Lindiwe Sisulu’s speech at the SONA debate 2014. 1. When she said the opposition parties were a let-down at the SONA debate. “I want to express my disappointment with the performance of the opposition parties during yesterday’s debate and even today, during the president’s State of the Nation Address. After all the hype that the media had worked up over the weekend that the opposition is bringing out the big guns, I didn’t even see a water pistol out of these people.” 2. When she wanted someone to admit President Zuma gave a very good speech at the State of the Nation Address on the 13th of February. “You must ADMIT it. Your own prejudice stands in the way of you ADMITING that the president gave a VERY good speech here on Thursday on a VERY good story.” 3. When she took a jab at COPE. She named and shamed the clingy “opportunists”. According to Lindiwe Cope “has no other vision but to cling onto President Thabo Mbeki". “He was the president of the ANC. He belongs to us. They cling onto these names [Nelson Mandela, Walter Sisulu] to give them credibility because they have no other credibility.” 4. When she took a jab at the DA. “You [DA] were unapologetically here to represent the vested dues of the past privileges as you are now. It is for this reason that President Mandela then called you a Mickey Mouse party. In fact he was being very generous; it is part of his nature. I think Mickey Mouse is a very likeable and popular character. Very unlike what you are.” 5. When she resorted to name calling. Lindiwe called the DA “a bunch of losers” and called DA leader Helen Zille The Pied Piper. “What you [DA] are, is just a damp squib; a party of empty excuses; a party of one person with no tangible policies or ideals.” According to Lindiwe, Helen aka The Pied Piper, is “leading you [DA] nowhere, just hunting down any black face that is willing to be bought by a few pennies.” *side-eye* 6. When she, like a teacher, showed the DA the error of their ways. Lindiwe felt the DA should have joined forces with COPE President Mosiuoa Lekota instead of Agang leader Mamphela Ramphele and that the DA shouldn’t have announced Helen Zille as President Zuma’s opposition in front of Parliament after their public fallout with Mamphela. “Honourable [Ian] Ollis comes here yesterday with what he thinks is a bombshell and he tells us that Helen Zille is standing against president Zuma in the upcoming elections. What in the world would drive anyone to such public self-inflected lynching? Why would anybody do that? Advice: it is not the way to go.” 7. When she channelled the inner storyteller in her. “My aim is to tell you what we have achieved, not only in the past 20 years since 1994, but specifically in the last five years under President Zuma and you will see the president’s good story is in fact a remarkable story. So sit back and listen.” 8. When she told a member of parliament (MP) to “Shut-up” because no one interrupts Lindiwe. The MP was just telling Lindiwe to slow down while she was reading her speech. Big mistake. She was reprimanded by the Speaker, Max Sisulu. 9. When she gave a cheeky response to the Speaker of the National Assembly of South Africa (who happens to be her brother) Max Sisulu’s request for her to withdraw her “shut up”. “Thank you, Mr Speaker, it allowed me to have a drink of water.” And then she sipped on some water and withdrew her “shut up. And then said “shut up” again, drank some water and then withdrew another “shut up” again… It just seemed like shut up was just chilling on the tip of her tongue. 10. When she refused to take any questions from the opposition parties. When the Speaker of National Assembly asked if she wanted to take any questions, Lindiwe remained silent and gave Max the “not interested” look and carried on with her speech.